While you want toys that entertain your children, you also like to find learning toys that can engage, teach and help your kids grow and learn. When I was a kid I loved playing with my little microscope and was amazed to see crystals growing. Guess that took me to a laboratory career later. My teenage boy is fascinated by rockets …. There are many toys that you can get that will help your child learn about scientific theories, improve their vocabulary and show them how to tackle complex math problems. Learning Toys For Kids come in toys for all age groups and both genders. There’s no end to the amount of knowledge that can be stored in a fun learning concept, and your child can learn reading, math, science, languages – and much more! Early learning toys are important because kids are more likely to remember what they’re taught if they enjoy the learning process. But don’t think that babies, toddlers and preschoolers are the only groups of children that benefit from educational toys. Older children (and even teenagers) can reap the benefits of childrens learning toys, too. If you’re searching for cool toys for kids that elementary age kids and teens would enjoy, then you should look for microscopes, telescopes, or science toys like robots. Many robots require that teens learn programming languages. Not only is programming a valuable real life skill, it also looks good on college applications. The Learning Resources Gears! Gears! Gears! Gears is a fun toy that’s also a learning toy. It allows kids to learn about science and how objects work together mechanically. The set is made of bright colors and the pieces are easy to grasp and fit together. Every time your child plays with the set, he’ll be able to make something new. The set has connectors, cranks, gears and base plates that lock together. The gears in the set can be used to create a variety of moving projects and the set is compatible with other sets in the same line. Read what other parents have to say – on Amazon. Studies have shown that kids who have access to learning toys at home often do better in school than kids who don’t. – check the price on Amazon. This handy lab lets kids discover wave theory, viscosity and more. The tools used in the lab set are patterned after real lab equipment. There are twenty different activities that can be performed with this set that can be completed using household items such as corn syrup. With this set, you’ll get the Slime-O-Nator, the graduated cylinder and the wave dome. Also included is a slime dome, slime poker, measuring spoon, mixing cup and dropper. An instruction book can help guide kids through the various experiments. Using basic ingredients, your child can learn various science projects that will entertain her. The kit includes a magnifying glass, a set of tweezers, test tubes with stands, an eyedropper, a funnel and beaker and a set of goggles. There is also an activity guide. Don´t worry, they don´t have to handle toxic chemicals. Kids just need some vinegar, baking soda, salt, food coloring, vegetable oil, lemon juice … mostly things you will have at home anyway.
. They can create a volcano or a sunset. The experiments included help kids to learn about acids and how to properly perform scientific methods. The kit includes an instructional guide, scoops, container of red cabbage powder, test tubes, some crystals, stir sticks and cups, baking soda, cotton swabs and more. is a device that contains age appropriate learning content for 3 year olds to age 9. Some of the content includes math, social studies, reading, language arts and science. There are more than 650 cartridges for the device. It also has a Kid Connect feature that you can use with your smart phone to send your child send your child messages. Your child can email you, send you his school artwork and more through the kid safe Wi-Fi. The device is a touch screen that has 8 GB of storage, but you can move that up to 40 GB. The screen is 7 inches big and the menu is easy to navigate.
. This microscope uses powerful magnifications to allow kids to study objects or insects. It can also be used to observe cells or organ tissue. The microscope has dual LED illumination, which means that kids can study above matter or below it. It’s battery operated. The set includes the microscope and slides, labels, cover slips, paper, a test tube, a dropper, non-toxic stains, a testing needle and a petri dish. (check the price on Amazon) can give your child hours of fun as he learns about school related subjects through play. This set helps kids conquer social skills, gets them ready for real school, and teaches them important language skills. Kids can pretend to be the student or the teacher. The set comes with an abundance of 149 items including report cards, stickers and a hall pass. There’s also a grade book, map, a dry erase board, a clock, a bell and more. This set features a handy fold up storage ability for easy clean up. ⇒ If there’s one annoyance that every kid knows about, it’s having a sibling show up uninvited into their room. puts a fun and entertaining spin on keeping those siblings from encroaching on your personal space. This learning toy helps the kids learn some basic programming skills that can also help aid with computer skills. By entering data into the keypad and control pad, kids can pick how the Defender will react. Once they’ve set up the coding, they can run it and see if there are any glitches or errors. The system can store as many as 18 different programs. The Defender can emit alarm sounds and flashing lights. It can also be used to create customized greetings or messages. (Amazon.com), is both a fun toy and a learning kit. Kids can discover the structure and shape of various crystals that they can grow. These crystals can be formed into a variety of shapes and different colors can be created. Kids can choose to create four crystals to grow in various sizes. They can create these crystals by mixing chemicals that are designs to produce a crystal in anywhere from one to seven days. With the plaster shape, kids can choose between a star, dolphin, lightning or pyramid shape, also I prefer the original crystal outcome. It takes time for the crystals to grow, so this is not the right learning toy if your children are short on patience. There are some things not included in the package, like the Mason jars, sugar cubes, and distilled water. Some of the chemicals used are not safe for young kids, so it requires adult supervision. (Amazon.com) teaches kids about synchronization, how electricity works and more. 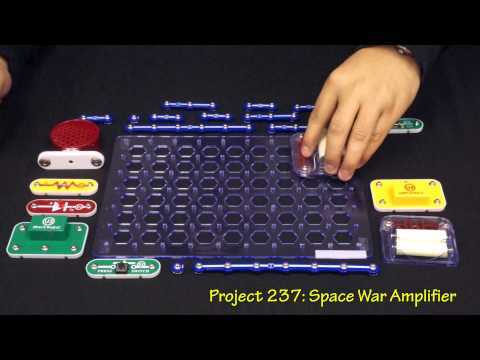 Using the snap circuits lights, kids can create over 300 projects that combine sounds and lights. The kids can operate lights, a compass and fans and even build an AM radio. Playing with this kind of award winning electronic learning toys opens youngsters the door to understanding engineering, programming, servos, sensors, gears, variables, and lots more. If you want your child to spend more time learning than they do playing, you need to merge the two concepts together. Playtime doesn’t have to be hours of mindless video games – it can be very educational, too! P.S. Please have a look at my next article about the best make music game for kids.